At the very center of the nervous system is your brain. What you see and hear first registers there. Imagine you are with your friends at school and they start acting silly. You see them and hear them, then decide you want to video them on your smart phone. All those thoughts have transpired in your brain, but the process doesn’t stop there. Once you’ve decided to video them, your brain tells you to pull out your smartphone, focus it on your friends, hit the record button and follow them around for a while. Although you may not realize it, your brain has masterminded each action. Your brain produces tiny electrical signals throughout your body so it functions properly. It sends these signals through pathways known as neurons. The system of neurons creates your personal electric wiring. The way your nervous system works can be compared to how your computer works. When you press the power on your computer, a signal goes out. The signal is a catalyst that generates a number of actions and responses. An electric current travels over the wires maintaining a connection to electricity. Your computer makes some sounds to let you know it’s working. Light comes onto the screen, images appear, programs are loaded and your Internet connects. In other words, based on the catalyst of the “on” button, your entire computer powers up. Your nervous system works similarly. When you want certain muscles to move, your brain transmits messages over your neurons. This pathway maintains a continuous electrical connection between your brain and your muscles. The connection enables your muscles to move the way you wish. Your muscles “power up.” That’s the essence of your nervous system. The nervous system is intricate with many elements working together. Your brain and spinal cord make up the first major part called the Central Nervous System (CNS). The nerves going to and from the CNS make up the second primary part; the Peripheral Nervous System (PNS). Bone protects the CNS from injury. It safeguards your skull or cranium the same way shells protect the soft bodies of snails and turtles. Vertebrae are the bones protecting your spinal cord. Unlike the skull which is a single piece of bone and can’t bend, your vertebrae are flexible. The flexibility is why you can twist at the waist or curl up in a ball. No type of boney armor surrounds your PNS. For example, have you ever had your arm fall asleep? When it does, you may not be able to move it or even to feel it for a minute or two. That happens because it’s been in one position too long and you have temporarily pinched a nerve. The pinch occurs due to lack of protection. That nerve is part of the PNS. You can also separate the nervous system by what it does. Pretend you saw a hornet buzzing around you and it wouldn’t go away. You’re positive it’s going to sting you, so you want to put some distance between you and it. You run in the opposite direction. Maybe you’re brave and swat at it instead. It flies away from you. Either action keeps you safe which is a function of the sympathetic nervous system. When it recognizes danger, it “powers up.” It makes your heart beat faster and pumps more blood to your muscles so you can put up a fight or run like crazy. In psychology, this is called “fight or flight.” Fight or flight actions happen when you feel threatened in any way. Let’s say no danger from bees, hornets or anything else is around you. But you are hungry and thirsty. You know you need to eat and stay hydrated. These are basic human survival needs. That’s when your parasympathetic nervous system kicks in. When you eat and drink, it “powers up” by ensuring your body digests everything correctly. It’s one way you remain healthy. Other functions like your breathing, blood flow, or heart beat happen automatically. These are spontaneous, and you never have to think about them. However, if anything in your nervous system changes, you’ll recognize something isn’t quite right. When you do, you’ll seek out a neurologist who specializes in how the nervous system works and how to help if anything’s amiss. When you watch a television show, you focus a lot on the main characters. But without a supporting cast, they would fall flat. The entire ensemble of actors is vital to the success of the whole show. The nervous system works the same way. The brain and spinal cord are the main characters, but they need support from the rest of the cast in the nervous system. The ones listed below are the ones you’re most likely to run across in a basic anatomy or biology class. Neurons – Neurons are nerve cells that respond to stimuli. A stimulus can either excite or irritate the nerve. Either one of these creates an impulse, which is a tiny electrical current that sends a message to the brain to act. There are four ways neurons are stimulated. Sound – When neurons in your inner ear hear something, you respond to it. When you hear certain sounds on your smartphone, your response is generally to look at it. Only seconds pass between the sound and your action. In that short amount of time neurons have received all that information from your ear and then sent it to your brain, and then to your muscles and eyes. Heat – When neurons in your skin feel heat, you react to it in some way. If you plug in your smartphone for charging and get an electrical shock, you’ll feel some kind of heat. Your first action will be to let go of the phone. Your neurons have orchestrated all the impulses leading to that action. Light – The neurons in your eyes are sensitive to light and dark. You will react accordingly. Imagine you are learning a new app on your smartphone. You watch a tutorial and then repeat the actions you’ve seen demonstrated. That very repetition is made possible through the light stimuli the neurons receive through your eyes. Pressure or Length – Your muscles also contain neurons. When they sense a change in length or even pressure, your muscles respond. When you pull out your smartphone, muscular neurons provide sensory impulses to your brain. In turn, your muscles know how much pressure is needed to hold the phone so that you don’t drop it on the floor. Neural networks, or connections, allow all these impulses to travel within your body. They operate much like the fiber optics connect you to the Internet. They send and receive electrical impulses quickly and reliably. 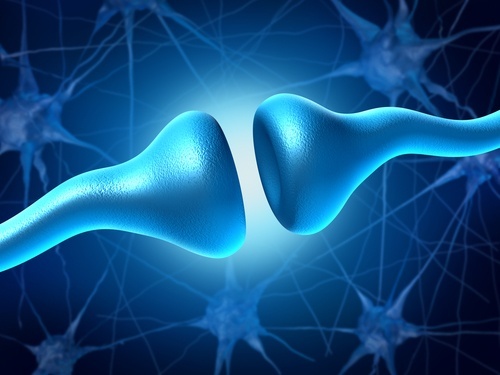 Dendrites and Axons – Dendrites and axons are extensions of the neuron or nerve cells. Dendrites bring information to the cell body. Axons take information away from the cell body. Text messaging is an example of how this works. There’s an electrical component (dendrite) in your smartphone that allows you to receive messages from your friends. A different electrical component (axon) enables you to send replies back to them. Soma – The soma is the cell body of the neuron. It works almost like an assembly line in a factory. It packages up everything a neuron needs to send impulses to the brain for use. Cerebrospinal fluid (CSF) – Cerebrospinal fluid covers the brain and the spinal cord. The fluid cushions the brain within the skull. It also provides general protection for the CNS. Lastly, it circulates nutrients and removes waste products from the brain. Blood-brain barrier (BBB) – This wall or gate serves as a type of security guard for the brain. It’s semi-permeable which means some things can get through while others cannot. The BBB prevents foreign substances in the blood from entering the brain. It also protects the brain from the hormones and neurotransmitters operating in other areas of the body. Plus, it maintains a stable environment for the brain. Cerebellum – The cerebellum allows us to move parts of our body voluntarily. We are able to walk, write and stay balanced. Cerebrum – Our brain is divided into a left and right hemisphere. The two spheres are located inside the cerebrum which is the largest part of the brain. Like a supervisor in a workplace, the cerebrum provides oversight for many of our activities of daily living. We can think critically and analytically due to our cerebrum. Talking, understanding language, and controlling our emotions are other actions controlled by this part of the brain. Left Brain & Right Brain – You have probably heard the phrases “left brained” and “right brained.” These terms refer to how we process information. People who primarily think on the left side of the brain (left hemisphere) seem more logical to us. People who mostly think on the right side of their brain (right hemisphere) seem more creative. Language and other logical processes may be conducted more on the left while visual and intuitive processes are carried out on the right. These are only patterns or tendencies, so it’s important to understand that both sides of the brain are involved in all processes in some way. Thalamus – The thalamus sorts all electrical impulses. It identifies the information coming to us through our senses and then directs it to appropriate areas of the brain for processing. Hypothalamus – The hypothalamus motivates us to eat and drink. It also maintains our normal body temperature of 98.6 degrees. Its other important function is controlling our pituitary gland. This gland manages all the other glands in the endocrine system. Medulla oblongata – The medulla oblongata is part of the spinal cord. It controls the heart and lungs. Among other things it also helps regulate breathing, digestion, swallowing and even sneezing. 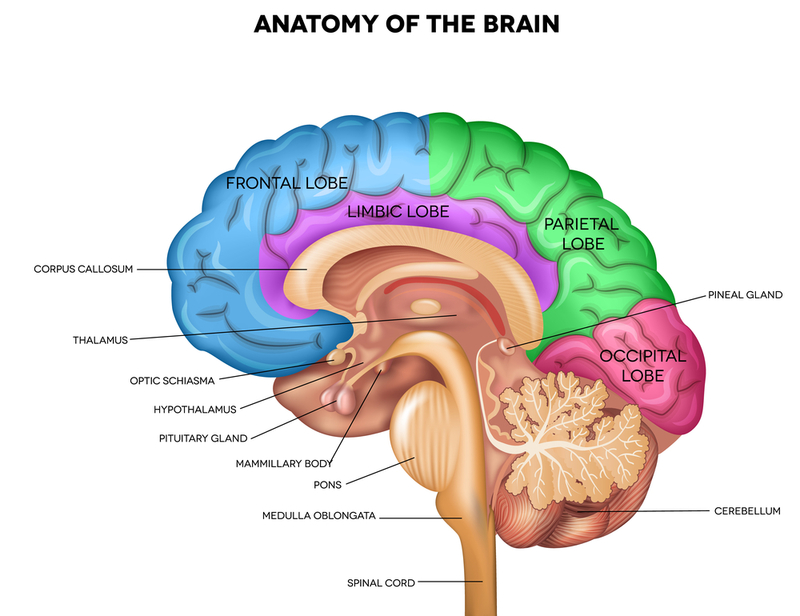 Midbrain – The midbrain assists with motor movements, especially those involving our eyes. It helps us process auditory and visual information. Pons – The pons is a connector within the brain. A part of the brain stem, it links the thalamus and the medulla. Neurologists and neurosurgeons become well acquainted with all areas of the brain – large and small. So it’s easy to understand why so many years of schooling are required before neurologists can practice. What health-related functions does the nervous system regulate? As you have seen, the nervous system relates to nearly every aspect of our health and well-being. It’s involved in something as simple as closing your eyes to managing more complex processes such as critical thinking. The nervous system impacts almost every part of our body at every stage of the life span. Specializing in how it all works together is important so we can maintain optimal health. Neurologists study the nervous system to understand when it is functioning properly or when changes impair it. Want to learn more about the nervous system? If you’re interested in the nervous system and what it takes to become a neurologist or neurosurgeon, The Apprentice Doctor offers a For Future Doctors Course and Kit you can start today. In addition to fact and theory, the course also provides opportunities to practice some of the skills neurologists, and neurosurgeons perform. In essence, you become an apprentice neurologist.